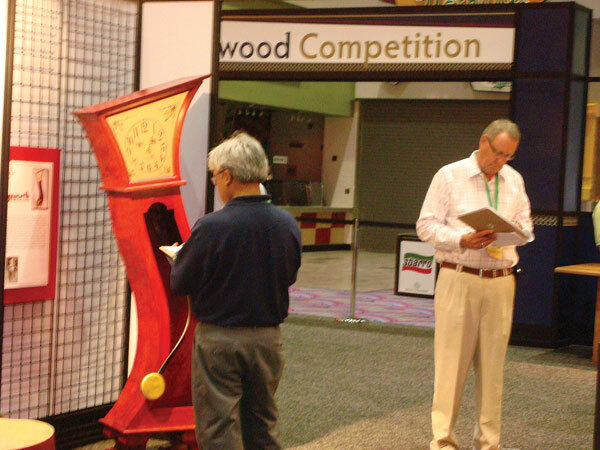 Judges on Tuesday zeroed in on the design, construction and composition of the 50 finalist projects selected from a group of 165 entries in the 2009 Fresh Wood student woodworking competition, held during the AWFS Vegas Fair. The winners from each category, including Best of Show and Peopleâs Choice, will be announced Friday evening, July 17, at the awards banquet. According to Adria Torrez, AWFS Education Manager, entries in the competition came from 49 different schools in the United States and Canada. Of the 165 entries received, 64 percent were from post-secondary schools, and 36 percent were from high schools. (See video above). Projects were evaluated in seven different categories: Case Goods, Chairs, Production/Contract Work, Reproduction, Tables, Open and Class Project. Tables garnered the most entries by both high school and post-secondary school students, followed by Case Goods. Monetary prizes will be awarded in each category to the first and second place winners and one honorable mention. AWFS also announced that for the first time, exhibiting companies are sponsoring the Best of Show and Peopleâs Choice awards. Custom Made is sponsoring the Peopleâs Choice award and Rikon Tools is sponsoring the Best of Show award. The Best of Show winnerâs school will also receive the $2,500 Larry Hilchie School Grant Award. Rikon is also sponsoring the inaugural Bravo to Teachers award.